This could almost be classed as a FAQ given the number of enquiries that roll in each year. 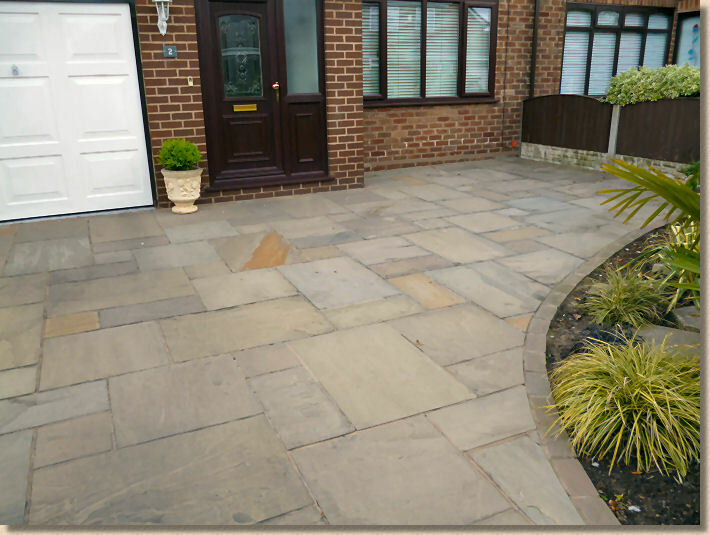 Homeowners want to use Indian Sandstone flags, which are normally considered as 'patio' flagstones, to pave a residential driveway, but worry that the flags may not be strong enough to cope with vehicular traffic. The good news is that it is possible to use certain flagstones to build a driveway, but that doesn't apply to ALL imported sandstone flags. The flags have to be the right type to be certain of success. 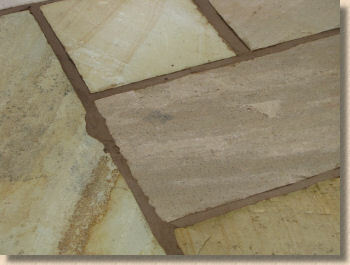 Pavestone, one of Britain's foremost suppliers of natural stone paving have faced a similar problem with many of their customers asking the same question and so they have graciously sponsored this page to offer their customers, and other people considering the use of flagstones on a driveway, independent and impartial advice on what is possible and how it should be done. 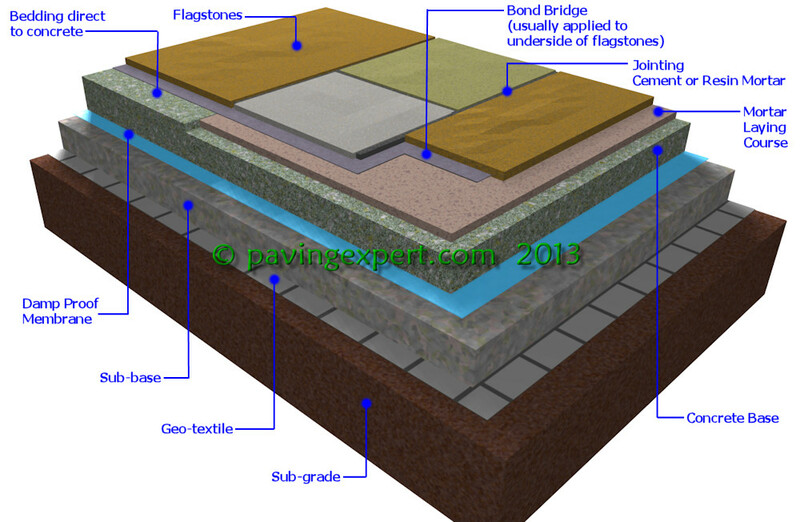 Consequently, many of the images used on this page feature the excellent Pavestone products. What flags can be used? There are two very distinct types of flagstone: there are those manufactured from concrete, and then there are those manufactured from natural stone. These two groups have quite different characteristics, so when it comes to driveway paving, careful choice is essential. There is a very wide spectrum of quality in both types. 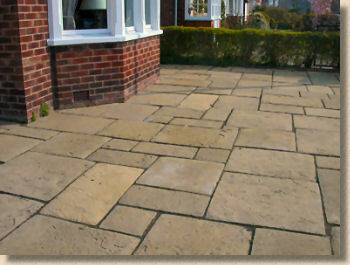 Generally speaking, for wet-cast concrete flagstones, the cheap or budget or economy slabs are rarely suitable. These products tend to have a low cement content and are specifically manufactured to a price rather than a quality threshold. When they fail, it is highly unlikely that the manufacturer will entertain any responsibility. Similarly, the cheaper pressed concrete flagstones were never intended to carry vehicles, even if the vehicle involved is only a little runabout used once a week to go to the shops. 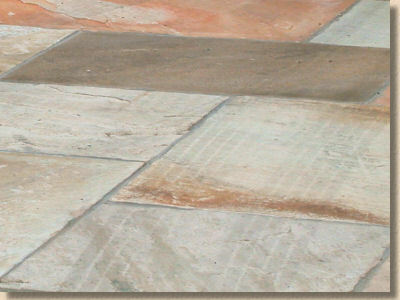 BS flagstones and high-end pressed concrete flags are usually satisfactory. There are pressed concrete flags specifically manufactured to cope with vehicle overrun but these tend to be laid as a flexible construction so are not considered any further on this page. 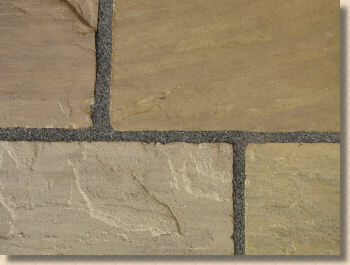 With natural stone, there is similar variation in suitability. The thin, cheap, less competent stones from 'bargain suppliers' are best avoided. The 'standard' 15-25mm thick flagstones, whether calibrated or not, are a bit of gamble, and the only genuinely suitable flagstones are those that are 30mm or thicker. 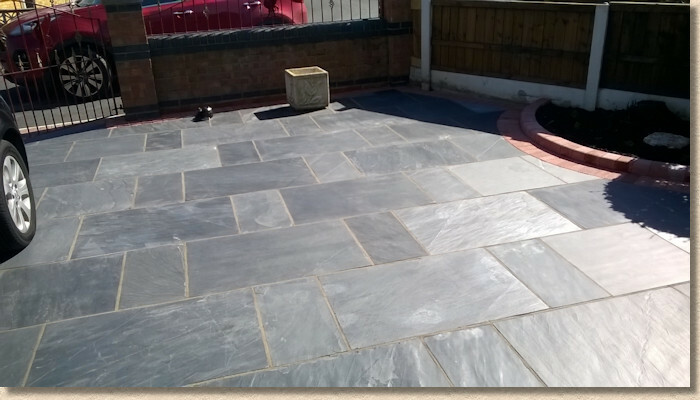 The heavier, commercially orientated >40mm thick flagstones are almost always suitable. 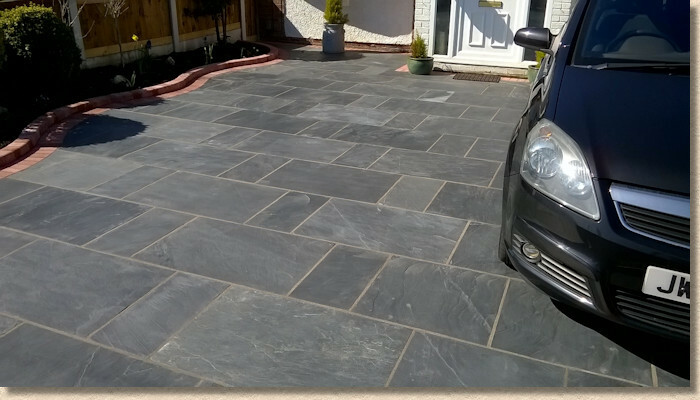 Pavestone have a range of specially selected 40mm thick flagstones and they are confident that these flagstones can be used for residential driveways as long as they are properly laid, following the guidance given below. It's worth noting that some types of stone are better suited to coping with vehicles than others. Some of the imported sandstones, notably Mint, is rarely a good choice, as it is pale and it is relatively soft. See also comments on colours below. Pale or light colours of either concrete or natural stone will often show tyre markings quite soon after installation. Similarly, flagstones with coarse textures (shot blasted or bush-hammered) may also be more easily marked than naturally riven, cast or sawn flags. The key to success with a flagstone driveway lies in the bedding and other sub-layers. 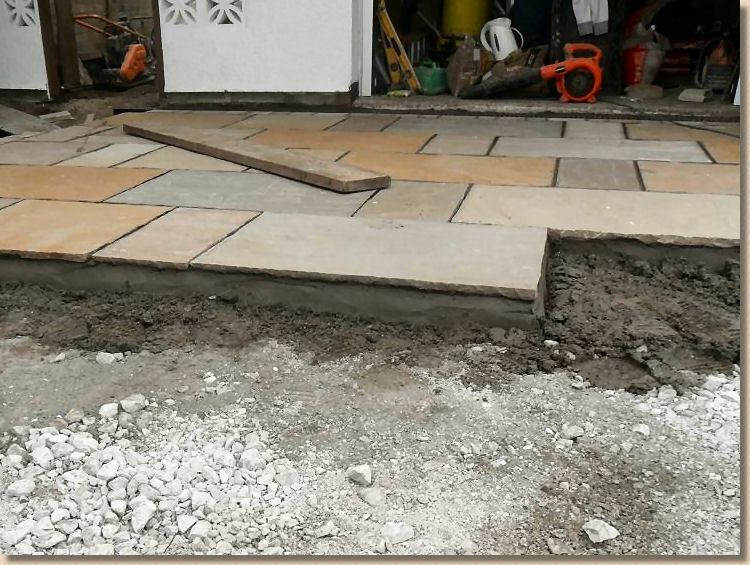 With the notable exception of small-element concrete flags, almost every other type of flagstone should be laid on a hydraulically bound laying course, which in simple English means cement mortar or concrete. The cross-section drawing shows four slightly different construction strategies. The choice of most appropriate strategy is largely determined by the ground conditions on site and the anticipated traffic loadings. There are two noticeable differences amongst the various options: sub-base and bedding. These are explored more fully below. The sub-base may be considered optional. On sites where the sub-grade is sound, or where traffic loading are expected to be minimal (cars only, and occasionally), it may be difficult to justify the additional expense of installing a new sub-base. However, whenever there is any doubt whatsoever regarding the existing ground conditions or traffic loadings, it is always better to err on the side of caution and include a sub-base. Notice also that a geo-textile is shown as an optional inclusion. Geo-textiles can be incredibly beneficial on sites where ground conditions are poor and we would always recommend their inclusion on sites with made-up ground, or where there is a shallow water table. In all options, the flagstones are bedded onto hydraulically bound material, but there is a subtle difference. On the left hand side of the cross-section drawing, the flags are bedded directly onto concrete. This concrete may be a site-mixed material, C20 or equivalent, or it may be a ready-mixed material. However, on many residential jobs, this material may more accurately be described as a 'coarse mortar', as a 3:1 mix of coarse grit sand (or all-in ballast) with cement is a popular choice for many contractors. Bedding directly is not for the faint hearted or the inexperienced. At a minimum of 100mm thick, each ten square metres will use a cubic metre, roughly 2¼ tonnes, of concrete/mortar, and as a cement-based material, it will be going off from the moment it is prepared, Consequently, this method best suits those gangs confident of laying flags accurately and rapidly. The right hand side of the cross-section drawing shows the indirect method. 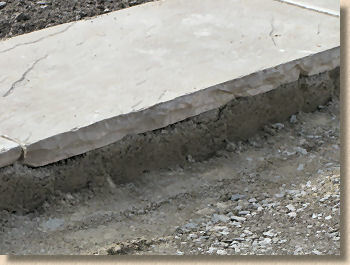 With this technique, a concrete base is installed prior to laying the paving, which is then bedded onto a relatively thin (25-40mm) bed of a suitable mortar or proprietary bedding compound. This technique is popular on some commercial and civil projects as the underlying concrete base may be installed some days or weeks earlier by a different gang, allowing the paviors and streetmasons to focus on what they do best: lay paving. It is also popular with builders and landscapers who may not consider themselves expert paviors, as there is less pressure on time than there would be with the direct bedding method. Similarly, this is a favoured technique for DIYers, as they need mix only, say, one barrowful of laying course mortar at a time and use up that (a barrow or two-bag mix will provide roughly enough mortar to lay 1m² of flags @ 30mm thick) before preparing the next mix. 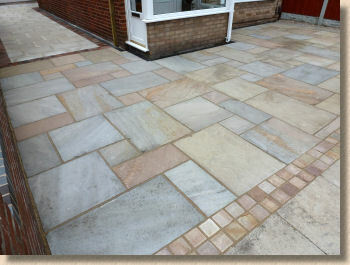 Flags are what we refer to as 'bed-dependent paving', which means that the bulk of the structural integrity comes from the bedding rather than from the jointing (which is often the case with setts or block paving), but it would be wrong to think that the jointing doesn't really matter. There is no preferred method for bedding. It's not possible to say that one technique is better than the other, and the choice is often left to the installation team. Where expensive proprietary bedding compounds are being used, it is usually cheaper to used the indirect bedding technique so that the bulk of the bed can be constructed using cheaper run-of-the-mill concrete without compromising structural integrity. The benefits of using a bond bridge or primer cannot be overstated. This will help prevent loosening of the flags when trafficked and will significantly improve early adhesive or bond strength in the completed pavement. They should be regarded as essential and not optional. 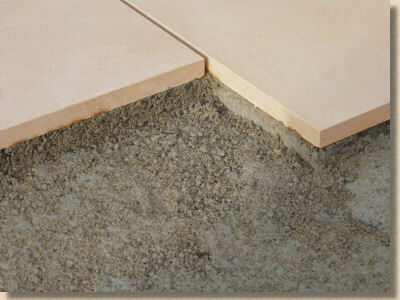 And in much the same vein, a damp proof membrane (DPM) beneath the concrete bed/base will help ensure it doesn't lose its essential water content when first placed (maintains w/c ratio) and so cures to the desired strength, and also helps protect it over the longer term from aggressive groundwater on sites where the water table may be shallow. As with all pavements where a large expanse of concrete is laid, movement joints should be used to help control potential cracking. 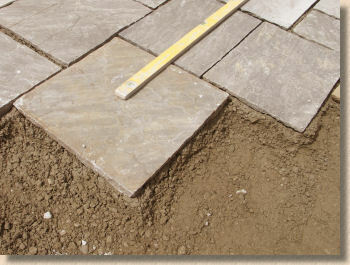 Joints should be carried through the paving layer whenever possible. Good design can help ensure that movement joints coincide with course or pattern joints within the completed pavement, and so avoid the need for unsightly saw cuts.